It's time to Fill the Cookie Jar! For March, the theme is Green or St. Patricks Day. I don't think I have a fraction of Irish in me, so this was the first time for me to really plan on baking anything with this theme. Since I had no preference, I let my cookie loving men pick what the cookie was to be. I gave them three choices. Lime. Mint. Or one with a beer reduction. They all vetoed the Lime option. Beer reduction was out because even besides Truckin' Man, all of my cookie connoisseur's have CDL's, and drive for a living. They don't take any risks, not even having booze baked into their daytime snacks. With all that, they picked mint. A tough one for me, since I do not care for mint. So, Truckin' Man brainstormed this creation up with me. In the end, this cookie was a collaboration of those around me! The end review, this cookie was delicious, but quite the sugar rush! One small slice seemed to be enough for everyone. Even the guys with the sweetest of a sweet tooth said that it was quite a rush. So, my advice... Serve with a glass of milk to help balance it! Melt butter, and cool to room temperature. Preheat oven to 325 degrees. In medium bowl combine flour, baking powder, baking soda, and salt. Set aside. In large bowl, beat the butter(melted and cooled) and sugars together on medium speed with electric mixer. Beat in the egg, egg yolk, and vanilla until combined. Add dry ingredients and beat on low until combined. Add the milk chocolate chips and Andes baking chips. Turn dough into skillet and press into an even layer. Bake for 20 to 25 minutes, or until cookie is a light golden brown. Remove from the oven and set on a wire rack to cool completely. Once cookie has cooled, prepare frosting. Beat butter at medium speed with an electric mixer until creamy; gradually add powdered sugar alternately with 1 tablespoon milk and creme de menthe, beating at low speed just until blended. Add more milk if needed to reach spreading consistency. Spread frosting on cookie. Set in refrigerator to chill for 30 minutes. Remove cookie from refrigerator. In small bowl add chocolate chips and butter. Microwave for 30 seconds; remove and stir. Microwave for an additional 20 seconds until completely melted. Spread over top of frosting. Chill for 30 minutes. This recipe looks fantastic. All the flavors we love in one neat little package. Delicious. This sounds wonderful... I love that you used creme de menthe ~ it is so good. 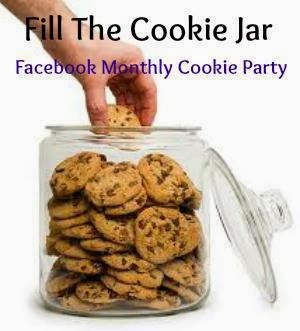 Great cookie to fill the cookie jar with for this month's theme. Ok, so this looks crazy yummy...I have never had a skillet cookie....but dang...yummo...a giant cookie, love it. I am going to have to dig out my grandma's cast iron skillet and give this one a try. I love this idea of baking in a skillet and I love your recipe using the Andes Mints and Creme de Menthe. Thanks for sharing. I love that you got input from a group on what type of recipe to make. What a great dessert! I love mint. Thank you for sharing with Foodie Friends Friday! G'day! Am salivating for a slice of this right now! Yum! This looks quite decadent and delicious! Well done and so perfect for St Pattys Day! Love skillet desserts and this one is super decadent! Bet it tastes delicious with Creme de Menthe! Super recipe -- bet the clean up is pretty easy. Looks delicious!